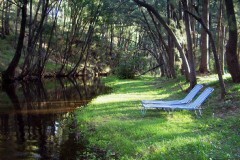 Exclusive use of superb river frontage property just 15 minutes from Mudgee. Generously equipped, fully self-contained house set in private valley. Two queen bedrooms plus double sofa bed. Superbly comfortable beds and quality linen. Abundant wildlife including resident mob of over 40 kangaroos. BBQ, TV, DVD, VCR, books, games. Complete your details below and your enquiry will be emailed directly to Paradise Mudgee. Please check your contact details are correct to ensure the quickest possible reply.